The lush, wild beauty of Dominica or the sights and scents of Grenada? Trekking across a dormant volcano in search of the gushing sulphur springs in Saint Lucia, or discovering the many beaches and hidden coves of Antigua? The truth is that you might want to do all of these things and more. And the beauty of the Caribbean is that you can. The Caribbean and its many islands and countries make it the ideal destination for island hopping, taking in two or more islands in a single trip, meaning your holiday just got a lot more exciting! As a starting point for your Caribbean adventure, Antigua has it all. The Caribbean of your dreams with a distinct English vibe, from Nelson’s Dockyard to English Harbour. 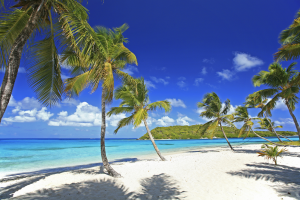 It would be easy to stay cocooned in the comfort of Antigua but just 90 minutes by ferry lies Antigua’s twin island Barbuda, just 60 square miles and dominated by its bird sanctuary. Here you can find unadulterated peace, and with spirits restored the Caribbean is your oyster! Head west for St. Kitts and Nevis and north for the bays and cays of luxurious Anguilla. Go south though, and you will reach Dominica. 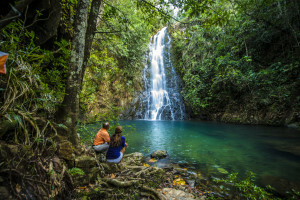 As the Nature Island, Dominica has tropical rainforests, waterfalls and over 300 miles of hiking trails. Think Saint Lucia, think lively Rodney Bay, zip-lining through plantation estates and of course the dramatic UNESCO World Heritage Pitons. Saint Lucia has enough to occupy your days and nights all on its own but to add a different flavour, island hop to St. Vincent and The Grenadines. It’s around a 40 minute flight from Saint Lucia to St. Vincent, and once here you’ll have 32 islands within reach. From the summit of La Soufriere volcano and its verdant Botanic Gardens to its picture perfect beaches, St. Vincent will beguile you. Then, just hop onto a ferry for the Spice Isle of Grenada, and the underground tunnels of Fort Matthew, the rolling hills of the Belmont Estate and the coral reefs of Anse La Roche. In the Caribbean, your island hopping combinations are endless. Pair the unspoilt and rugged with the indulgent and luxurious, hop from the Caribbean’s best loved islands to its best kept secrets. It’s time to experience the Caribbean in all of its guises with your island hopping adventure of a lifetime!